Marie Rosenmir on the OPUS-list! Marie Rosenmir has been ranked in the latest issue of OPUS as one of the most important 20 musical happenings in the country during 2016. 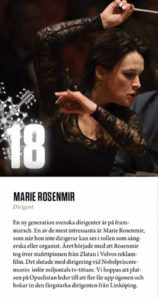 OPUS, Sweden’s largest magazine for classical music, defines Marie Rosenmir as being one of the most interesting Swedish conductors of the new generation.